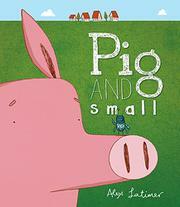 Can a pig and a bug become friends, or will the matter of size get in their way? Pig’s nose has never squeaked before, but one morning, it does nothing but. It squeaks when he eats, when he feeds the pigeons and when he takes a bath. He can’t find an answer in the big medical book, so he inspects his snout himself. What he finds is a squeaky bug who seems to want to be friends. Pig’s agreeable. He gets out his tandem bicycle, but when they ride, he feels he does most of the work. Bug makes Pig a cake to apologize—but Pig eats it in one bite without even remarking on the decorations. Their vastly different sizes get in the way of everything they try to do, so they go their separate ways….Then Pig sees an ad for a movie and realizes there are a ton of things the two can do together. They enjoy the movie, a museum, the aquarium and the zoo. There are still things they don’t enjoy doing together (like playing catch), but mostly they don’t even notice the difference in their sizes any more. South African author-illustrator Latimer isn’t quite as successful here as in Lion vs. Rabbit (2013) and other previous, slightly skewed outings. Here the absurdity may induce a smile—but not a laugh.